Truckvault Hamden Connecticut Utility Communications Inc.
Utility Communications is a certified dealer for TruckVault. Their products are Made in the USA! They have been in business since 1995 and they are recognized worldwide as the leader in the secure in-vehicle storage solution market. 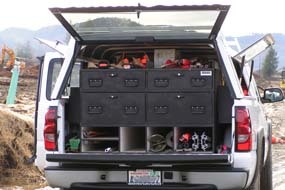 TruckVault’s mission statement is simple, “Manufacture and sell superior quality secure storage and logistics support solutions to Public Safety officials, Businesses and Outdoor Enthusiasts and back this up with constant product improvement processes, a limited lifetime warranty and a dedication to customer service that is unrivaled.” This has served thousands upon thousands of happy customers well. 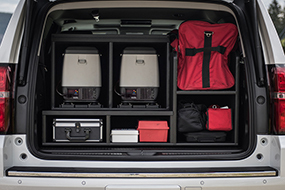 TruckVault has a solution for every secure in-vehicle storage need, whether it be for a Pick-up, SUV, Sedan, Van or any other vehicle on the road today. In addition to their vast array of stock designs, they can also design a custom solution for you. Here at Utility Communications, we can walk you through every step of the process to ensure you get the product you need to tackle your particular requirements.